Designed to last many lifetimes! Industrial quality; requires 30% less energy to turn. Easy dial self-locking adjustment. Large hopper holds 2 lbs of wheat. Hand-cast solid aluminum body. Easy conversion to electric motor. The Country Living Grain Mill will grind virtually all dry grains and legumes, including wheat, corn, beans, peas, amaranth, etc. 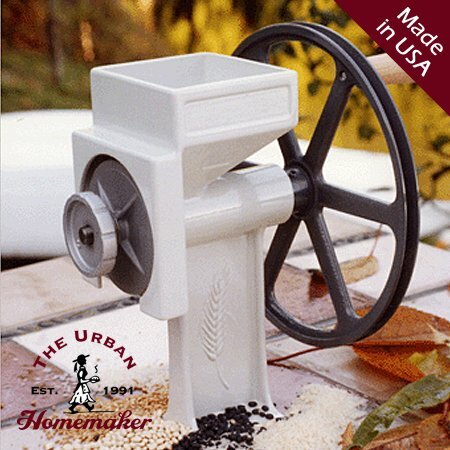 The Country Living Grain Mill is designed to be quickly and simply motorized. 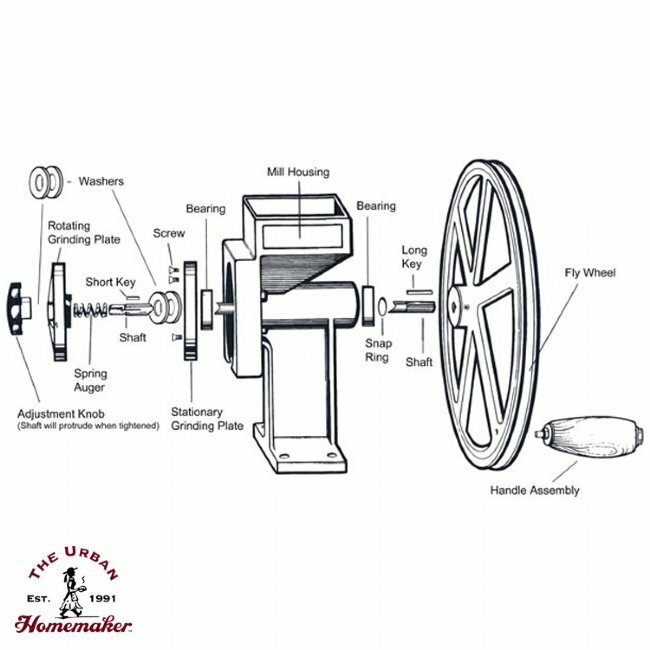 The industrial quality and ease of use is what sets the Country Living Grain Mill apart from other hand mills. Double-sealed industrial armored ball bearings and its hand-cast solid aluminum body give the Country Living Grain Mill the strength to last many lifetimes. Solid I-beam construction from cast aircraft aluminum, double industrial sealed bearings, stainless steel shaft, and carbon steel grinding plates come together to make a rugged and durable mill, which the manufacturer backs with a lifetime warranty. Note: Before shipping, all Country Living Grain Mills are tested. The factory will test grind some wheat with each Country Living Grain Mill to ensure that it is functioning properly. 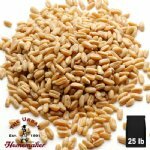 If you are gluten intolerant please note that in the requests and concerns portion of the order form so that we can test your Country Living Grain Mill with an alternate grain such as rice. Your grain mill is designed to be easily motorized. The flywheel is grooved for use with a standard "V" belt. We recommend using at least a 1/3 HP motor rated at 1,150 RPM and equipped with a 1-1/2" pulley. This ratio will produce about 115 to 120 RPM at the flywheel. Other motors may be used, but they will need to be geared so that the RPM at the flywheel does not exceed 120 RPM. The motor and the mill should be securely fastened to a substantial surface. The mill handle MUST be removed before motorized operation. NEVER ALLOW THE MILL TO OPERATE WITHOUT GRAIN BEING PROCESSED!! Belt size may be determined by the distance the motor is mounted from the mill. Belt tension should not be excessive or bearing damage may occur. 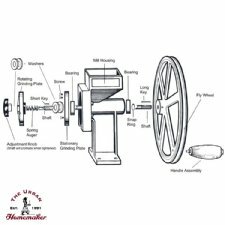 Note: Due to the many variables introduced during motorization, the warranty is void if the mill is motorized. CAUTION: Full liability and responsibility for complying to all Federal, State, and Local Safety Standards is assumed by any person or persons who modify or motorize the Country Living Grain Mill in any way. Motorized mills should be operated by adults only. Note: All belts and pulleys not driven by hand should be enclosed for safety.